The Sounders have set a Major League Soccer single-season record with eight consecutive wins in the post-shootout era. While some Seattle sports teams hold longer streaks, some aspects of the Sounders' stretch hold up rather well. Winning eight professional soccer games in a row is hardly commonplace in a sport that garners more ties than any other. 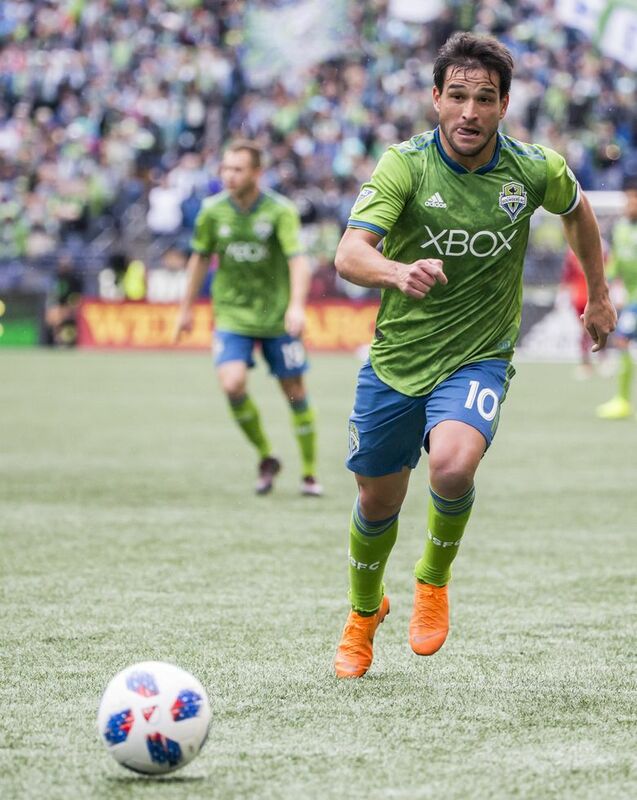 Thus, the Sounders setting a Major League Soccer season record in the post-shootout era by capturing eight straight behind the exploits of Nicolas Lodeiro, Raul Ruidiaz, Stefan Frei and others is truly noteworthy. If they extend the streak to nine with a win at Vancouver on Saturday, their run will comprise more than a quarter of their season. But whether it’s the “best” winning streak by any Seattle major pro team depends on the criteria used for historical context. The Sounders have blown the Los Angeles Galaxy off the field during this stretch, but barely squeaked by Minnesota United FC with two stoppage-time goals and were out-possessed by Portland, New York City FC and Sporting Kansas City. “We’ve been able to win games not necessarily dominating every game and that’s the sign of a good team sometimes,’’ Sounders midfielder Harry Shipp said. For sheer wins, the 2001 Mariners at 15 straight, the 1995-96 SuperSonics at 14 and the 2005 Seahawks at 11 all have the Sounders beat. In fact, the Seahawks came just an overtime loss to Washington away from winning 14 in a row that year and tying an NFC regular-season record. But despite the 11 straight wins by Matt Hasselbeck, Shaun Alexander and company comprising 69 percent of their team’s 2005 season schedule, the odds of a streak-snapping tie in the NFL pale next to soccer. The Seahawks have played one tie game their entire history, while MLS through Tuesday saw 22 percent of 621 matches end in draws this season alone. Also, NFL squads typically have a week to recover from games, whereas soccer teams can play three times during that span. Baseball occurs nightly and randomness can impact even the most stacked winning rosters. That puts the 15 consecutive wins by the Edgar Martinez-Ichiro-led Mariners into more impressive context, despite that mark only comprising less than 9 percent of their season. Only nine baseball teams have had longer streaks than the 2001 Mariners the last century. Worth noting, though, is that only the first five of those 15 straight wins came on the road. The Sounders have won three of their eight on the road, something coach Brian Schmetzer says is key to extending any streak. Schmetzer feels his team is helped by trying to stay aggressive whether at CenturyLink Field or away. Like the Sounders, the Seahawks won nearly half their games on the road — 5 of 11 — during their streak, while the Sonics garnered exactly half of their 14 consecutive wins away from KeyArena. Still, going off recent history, their streaks were less a rarity than what the Sounders and Mariners managed. Ten NFL franchises have matched or surpassed the Seahawks streak within the past 21 years — including the 2007 New England Patriots capturing a season record 16 in a row. The Gary Payton-Shawn Kemp-led Sonics streak wasn’t even halfway to the NBA record of 33 set by the Los Angeles Lakers in 1971-72. It was also only the third-longest streak of the 1995-96 season and there have been 18 NBA teams that have won at least 16 in a row since the Sonics set their franchise mark. Meanwhile, the Sounders own the season MLS record of eight straight wins dating back to when the league’s shootout era stopped after 1999. Prior to that, the Galaxy won 12 in a row in 1996. So, the Sounders accomplished something no other MLS team has in 21 seasons. And no major Seattle sports team can claim that. Still, the fact remains MLS is an evolving league in just its 23rdseason that has changed dramatically in terms of competitive balance the last decade alone. Meanwhile, MLB has had more than a century to establish itself, while the NFL has been around 98 years and the NBA for 72. Among more established global soccer circuits, the Sounders record is dwarfed by 19 consecutive German Bundesliga wins by Bayern Munich in 2013-14. Manchester City of the English Premier League won 18 straight matches last year, while Inter Milan won 17 consecutive games in Italian Serie A play in 2006-07. Over in Spain’s La Liga, Real Madrid in 2016-17 tied the season wins record of 16 held by the 2010-11 Barcelona squad. So, the Sounders — with eight games remaining — still have a ways to go to match some of Europe’s finest. Sounders right back Kelvin Leerdam never had a winning streak this long playing in the Dutch Eredivisie. But his Feyenoord team went unbeaten in 11 to finish 2011-12 on a 9-0-2 run. Leerdam figures the key to this stretch has been the Sounders keeping the ball out of their net, outscoring opponents 19-4. None of Seattle’s streak-setting teams also managed to win a championship that same year — the Seahawks losing the Super Bowl to Pittsburgh, the Sonics dropping the NBA Finals to Chicago and the Mariners bowing out to the New York Yankees in the American League Championship Series. Indeed, the Sounders seem well positioned to at least try to match the Seahawks and Sonics by making it to the MLS Cup final a third straight time. But if the season ended today, they’d be playing a sudden-death knockout-round game on the road — making it in their best interest to keep this streak going.